An acquaintance from my doctoral fieldwork days emailed me last week to let me know of an upcoming television mystery series based on works of Buddhist fiction. He had read the announcement on the buddhistdoor news page and thought I should know. He was right. Thanks go out to D. for the heads up! If you’re like me and you feel the need to read the original novel of a movie or television series before watching the story brought to life on film, then you will want to read The First Rule of Ten: A Tenzing Norbu Mystery series by Gay Hendricks and Tinker Lindsay. Ten, short for Tenzing, is the ex-monk protagonist of this mystery series published by Hay House in 2011. There are now five novels in the series, each based around a theme or “rule” that Ten espouses and/or learns as part of the novel. Ten’s first rule is “Don’t ignore intuitive tickles lest they reappear as sledgehammers.” This series is another example of the intersection of Buddhism and mystery I wrote about in July 2016 that creatively links Buddhist experience to the types of reasoning skills and intuition required to deal with enigmatic situations. You can find the Tenzing Norbu Mystery series on dharmadetective.com or the Hay House website or Amazon. As an aside, it’s interesting to note that Hendricks’ and Lindsay’s novels are categorized as “spiritual fiction” by the publisher. What do you make of this? With the autumnal equinox behind us, and the western world thinking about all things harvest and Hallowe’en, the introduction of two new works of spooky Buddhist fiction is apropos of the season. The Haunting of Cragg Hill House by Elyse Salpeter, 2017 Publisher: CreateSpace Independent Publishing Platform/Amazon Digital Services LLC. “Elyse Salpeter is an author who loves mixing “the real with the fantastic” in her books. She likes nothing better than taking different scenarios and creating worlds where things just aren’t what they appear to be. Waking the Fake Snake: The Mystery of the Blue Robe Manuscripts by Mat Skybrook, 2017 Publisher: Vajra Books, Nepal. It is summer 1985 and the young American teacher Richard Tatem heads for the Himalayas, there discovering a rare manuscript of the secret Blue-Robes cult. Hoping to kick-start his career and regain the affection of Miki Tojinbara, an unforgettable Japanese junior colleague from Osaka who has recently ditched him, Tatem returns to India. His search goes dangerously awry when he finds himself hunted by ruthless later-day guardians of the supposedly dead Blue Robe cult. Meanwhile, Tatem and Miki try a second time to see whether Buddhist love is really a contradiction in terms. Touching a fake snake for Tibetan Buddhists can symbolize overcoming false fears through insight. Filled with both lofty Buddhist philosophies and gritty Tibetan reality, this novel thus explores perceptively the limits of obsessive attachment and romantic love for Buddhists. Like A. S. Byatt’s Possession did for English literary research, this compelling Himalayan mystery dramatizes Tibetan and Buddhist studies field-work, with nearly as many true historical wrinkles as The Da Vinci Code. I am pleased to announce the publication of a volume of short stories by the young, talented author An Tran entitled Meditations on the Mother Tongue (C&R Press, 2016). I have read the first three stories and I don’t want to put the volume down in order to do my own work, but I must. So a full review will have to wait until the end of May or early June. You can read and review the stories yourself if you buy the book through Amazon HERE or Barnes & Noble HERE . A deaf child discovers to her delight that she can communicate with zoo gorillas in her native language. An old man grieving for his departed wife looks to the giant turtle in Hanoi’s sacred lake for solace, believing it to be a god. An American scientist searches the mountains and rivers of Sumatra for signs of an otter believed to be extinct. A young man finds a surprising connection to his Vietnamese heritage when he takes up the acrobatic sport of parkour, motivating him to re-learn his forgotten first language. In rich and vivid prose across twelve stories, men and women are displaced from their loved ones, their cultures and their homes, and look to the natural and spiritual worlds in search of anything that can offer a sense of belonging and lasting satisfaction. These are careful meditations on the desire to know one’s self and be known by others, where parents and lovers alike appear as gods or as ghosts, dominating and unknowable, and where the bonds between fathers and sons and brothers, men and women, husbands and wives, are built, tested and found lacking. How many bibliophiles do you know who anxiously await the publication of a new book in a series? The reader’s longing for the next instalment exemplifies the efficacy of narrative to expand meaning for the human experience. For often a fictional world becomes so real for the reader that she grieves when the story has ended. That’s why I’m pleased to announce that Eliot Pattison’s 9th book in the Inspector Shan Tao Yun series was published in March. It is entitled Skeleton God (2017). Pattison’s first novel of this series, The Skull Mantra (1999), won the Edgar Allan Poe Award for Best First Novel in 2000. The series has been translated and published in over twenty languages. His work can be read on so many levels, from the cultural to the political to the spiritual. I read the Inspector Shan mysteries as fictional imaginings of lived religion in Tibet under Chinese occupation. Blurb: “In Eliot Pattison’s Skeleton God, Shan Tao Yun, now the reluctant constable of a remote Tibetan town, has learned to expect the impossible at the roof of the world, but nothing has prepared him for his discovery when he investigates a report that a nun has been savagely assaulted by ghosts. In an ancient tomb by the old nun lies a gilded saint buried centuries earlier, flanked by the remains of a Chinese soldier killed fifty years before and an American man murdered only hours earlier. Shan is thrust into a maelstrom of intrigue and contradiction. “An international lawyer by trade, Pattison spent many years in the backwaters of Asia, fascinated by how Buddhism shapes all aspects of people’s lives. He recently received the prestigious “Art of Freedom” award from the Tibet House, an international non-profit organization devoted to the preservation of Tibetan culture, founded by Columbia University professor Robert Thurman, actor Richard Gere and composer Philip Glass at the behest of the 14th Dalai Lama. The novel White Tiger Legend by Hu Yuan Nabe was written for young readers, particularly those with a passion for the martial arts. The authorial pseudonym is a play on Chinese and Japanese words that begs the questions “who you wanna be?” The first-time author behind the pseudonym, Kory Juul, is an accomplished Hollywood visual effects artist who has worked on movies such as The BFG, Deadpool, Avatar, the Hobbit Trilogy, Pirates of the Caribbean: At World’s End, Star Wars: Episode III – Revenge of the Sith and the Matrix sequels. He has also harnessed his visual effects skills to bring White Tiger Legend to the screen. The animated movie is currently in post-production but to get an idea of the characters in the story, check out the website http://www.whitetigerlegend.com . Juul’s first novel tells the marvelous adventures of Zi, a young Shaolin monk who lived about 400 years ago in China. But it is more than just a young reader’s adventure story. Juul combines Buddhas, bodhisattvas and an understanding of Taoism with extensive martial arts knowledge, wisdom gleaned from a deep empathy of many cultures, and a sense of humour that bubbles through the story like a babbling brook. Below is a summary and some reviews from the PR package for White Tiger Legend. As one of the reviewers noted, I wish this story was around when I was a kid! Enjoy. Buddhism is awesome. It is liberating. Everyone loves freedom. But how do you present such amazing concepts in a way the next generation will connect? Knowing an idea is one thing, but breathing it and feeling it enhance your life is another! It was for this reason that White Tiger Legend was written. It is a Buddhist sneak attack on the heart of every young adult beginning to fall into maya. It’s time to dance again! Journey back to 12th century China, and discover the tale of Zi, a young Buddhist monk who loses everything – his home, his family, and the Shaolin Temple. Armed only with his pet grasshopper and courageous little heart, Zi embarks on an epic quest for enlightenment and to become a Kung Fu Master. Such an impossible journey can only have an incredible ending! What a gift to learn such life enhancing lessons so early in life! White Tiger Legend is now available in Audiobook, Paperback, and Ebook formats at Amazon, Apple, and Barnes & Nobles. Way back in May I promised to review Manchu Palaces, a novel by Sinologist Jeanne Larsen, first published in 1996 by Henry Holt and Company,Inc. I guess readers could consider this an anniversary review since the book is twenty years old this year. I suggested to Dr. Larsen that her novels be reprinted in a digital format so that readers could more easily access these wonderful works. That would be a nice way to commemorate the first publication anniversary. This novel is Larsen’s third in her Avalokiteśvara triptych, each of which features Guan Yin who complicates or moves the plot. The previous novels are Silk Road (first published in 1989, set in the Tang dynasty) and The Bronze Mirror (first published in 1991, set in the Southern Song), but the reader does not have to read these in order to enjoy the story of a young girl growing up in China that is at the heart of each novel. Further, every novel of the triptych has a fantastic, cosmic framework reminiscent of Buddhist jātaka and sūtra structures. Lastly, every novel in the triptych features different types of narrative perspective and voice and a story built with various genre styles, some modeled on Chinese literary genres or scholarly works. Given such variety of narratives contained within each novel of the triptych, this brief review of Manchu Palaces comes with a caveat. The novel is so elaborate that I cannot convey all of the intricate, marvellous aspects of it in this blog post. Reading this novel is like taking a long trip to a foreign country and having such a profound experience that the souvenirs and photographs cannot possibly accommodate or express the lasting impression. 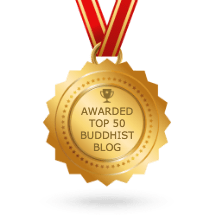 What I can do is provide my favourite elements of the novel and hopefully leave Buddhist Fiction Blog readers wanting more. But first, preliminaries. Manchu Palaces, set during China’s Qing dynasty, tells the story of Lotus, a young girl and sole heir of a well-to-do Manchu family of bondservants to the emperor. When the reader meets Lotus, her mother has died and yet through her grief she must figure how to navigate family tensions and filial obligations on her journey to womanhood. Her best option for a secure future is to marry well, but along the way she wins a commission as a maid-servant to the Empress Dowager in the Forbidden City, a place that will become her own personal mandala, of sorts. For Lotus’ journey to womanhood also takes a spiritual route affected by her deceased mother Cassia, bodhisattvas such as Guan Yin, and Confucian and Taoist spirits. Both Lotus and Cassia will transcend their current states if Lotus can only find a misplaced white Tara statue and its thirty-six lost companion statues that form their own mandala. Whenever I am presented with such an engaging opportunity for imaginary travel in Asian time and place, I am almost always on the lookout for one thing: what is “distinctly Buddhist” in this narrative? The jacket cover of Manchu Palaces actually uses the phrase “distinctly Buddhist perspective” to describe the way Larsen examines human loss and human folly. And I think this perspective is achieved, remarkably so, within the context of the Qing dynasty Chinese setting. “Guan-yin’s in on this?” Great bulging eyes roll as exasperation washes over that green face. “Well now. We’re all in this together, aren’t we? Mustn’t forget that.” Lord Mount Tai chortles, though Cassia’s not sure she sees the joke. [Cassia and Wu Ming are sent back to earth as ghosts to achieve their mission]. Manchu Palaces, pp. 91 – 93. What Larsen has managed to do in this scene is imagine the syncretism of Chinese religions in a way I could never have envisioned until reading her novel. For years I have struggled with getting my head around just how Chinese ancestor veneration worked in conjunction with Buddhist concepts of rebirth into other realms. This imagined account highlighted Buddhism’s role in Qing dynasty culture while maintaining the integrity of syncretism among Chinese religions. “A warm breeze comes up like a blessing from the Southern Sea. Surely this much is true—call it delusion, call it karma, call it free will and human perversity, call it the zigs and zags of narrative complications or tangled chains of psychological cause and effect: Neither storyteller nor incarnate being travels an easy straight-line road” (Manchu Palaces, p. 223). The various narrative perspectives and different narrative voices give the novel a breadth and depth that reflect Larsen’s own dynamic acuity for Chinese culture, history and literature. Manchu Palaces is categorized as a fantasy due to the cosmic elements of the plot, but perhaps due to its narrative perspectives and voices, I read the novel as a work of historical fiction that brought past eras and unfamiliar locations to life. Manchu Palaces will be well received by any reader looking for an engaging story that could fall into the genres of Women’s Writing, Historical Fiction, Fantasy, and of course Buddhist Fiction. Better yet, if you want to go on a trip to China and don’t have the resources to leave your current situation, just pick up this book here. I am very proud to announce the publication of my Oxford Bibliographies in Buddhism article “Buddhism and Modern Literature.” It came online yesterday and I am excited to see how it develops over the next few years, since I am sure I will have to add to it as Buddhism continues to intersect with modern literature in a multitude of forms and ways. The citations cover Buddhism in modern fiction, poetry, creative non-fiction, autobiography and biography from around the globe. Have a look here: Buddhism and Modern Literature. Beal, Chris. “An Interview with Ruth Ozeki about Her New Novel: A Tale for the Time Being.” Buddhist Fiction Blog (10 April 2013). This engaging interview reveals the Zen aspects, influences, and nuances of Ozeki’s award-winning novel A Tale for the Time Being (2013). Beal’s well-honed questions solicit deep and provocative answers about Zen Buddhism, fiction, and philosophy. Beek, Kimberly. “Telling Tales Out of School: The Fiction of Buddhism.” In Buddhism beyond Borders: New Perspectives on Buddhism in the United States. Edited by Mitchell Scott and Quli Natalie, 125–142. Albany: State University of New York Press, 2015. Beek examines the reception of Buddhist stories narrated inside and outside of Asian contexts by comparing the different reflections of Buddhism in Amy Tan’s Asian American novel The Kitchen God’s Wife (1991) and Keith Kachtick’s Buddhist-infused novel Hungry Ghost (2004), suggesting the emergence of Buddhist fiction. The whole bibliographic article contains over 80 citations to general overviews, anthologies, primary works, articles, dissertations, web sites, etc. that outline the depth and breadth of Buddhism and Modern Literature. If you cannot access the entire article directly from the Oxford Bibliographies web site, you can probably access it through an institutional library. Happy perusing! !